Looking to implement a solution now, or perhaps you want to dip the toe in the water to see what bettHR is all about? These proven quick-start solutions will provide you with real measurable value and results that you can implement immediately. Exactly what to focus on to increase your HR team’s strategic capabilities. Remove overwhelm and the unknown of where (and how) to start. A high-level action plan including HR metrics and employee communications with specific feedback, guidance and prioritization for your HR team. An annual calendar of when to deliver communications for all major HR programs including goal setting, performance management, open enrollment, wellness campaigns, employee engagement survey, mission and value reinforcement, and more. Guide on how to incorporate your company-specific events into the annual calendar, based on best practices. Communication channel guidebook to ensure you’re delivering the messages to the right audience in the right way. Sample messages to get your communications started… and more! In three easy steps, prove the value you deliver and tell a more effective HR story. Create your HR Story Snippet – and learn what that is! Take the first step to creating a culture that actually engages your employees. 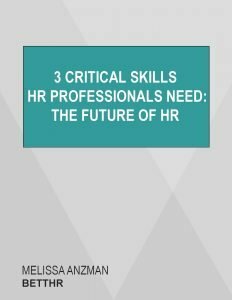 The three critical skills to lead the future of HR. The current state, future state and why it all matters for each skill. Contact us to talk about how we can help you solve your current HR challenges.